Spent the better part of the day rooting around inside my computer with my mom. The rest so far has been spent convincing it that it hasn’t been broken, but upgraded. I have finally convinced it of this… I think. At the very least I can type and use the internet. So far, as they say, so good. I did manage to seperate out the art posts from the actual comic archive. If you read from page one you should only see pages of the comic. That said, the only way to see the art posts now is to find one in the archive and navigate to it from the latest one listed… For some reason the Super Carol comic won’t show in the archive list, but it IS still there. You just have to navigate to it from another art post. It’s the only art post that’s like that. It is possible that all the ones from here on will be that way unless I figure out how to fix it. Still, the comic is the main thing, and that seem to be functioning normally, as far as I can tell anyway. 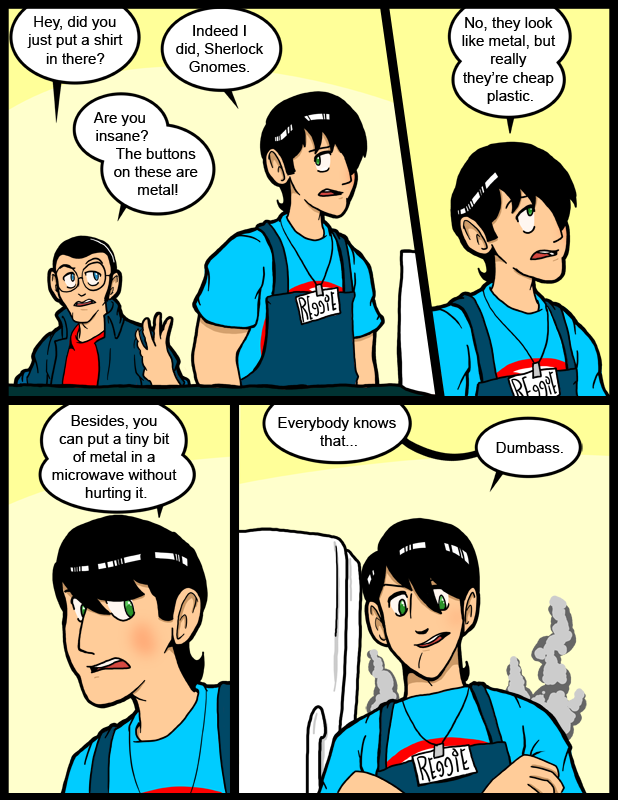 The stuff happening in the comic was written a long time ago, and having experienced a lot of microwave mishaps are true to my life. That said, I actually looked up the abilities of microwaves just to see is you could still do this, at least in theory. I was satisfied that this could indeed happen if you are an idiot, like Reggie, and just started heating a moist shirt without taking care not to do it for too long at a stretch. The worst fire I ever started in a microwave was a glazed doughnut. I’m not even sure exactly how it ignited, but it filled the entire apartment with smoke. Luckily the microwave survived to heat other things for me. Things including leftover French fries which I caught on fire somehow. The second worst fire I ever started in a microwave. I haven’t started a fire in a microwave in a couple of years, but my failure rate predicts that I’m due for one again soon. It could potentially be microwave popcorn which I will set on fire. The third worst fire I ever started in a microwave was popcorn, and it was the easiest to do. Although they were all easy to do, if I’m honest. In a final note, Fes, who fixed up the site last week, lost his brother over the weekend. And I don’t mean at the mall or someplace. T^T Of course the only thing you can do when tragedy strikes like that is be there for your friends. So, if you can, be there for him. My prayers go out to Fes, I may not know him, but best wishes, and my condolences. I’m sorry to hear that, my condolences to Fes. How do you ignite microwave popcorn in the microwave? surely the name is contradictory to the action. How far back DID you write these strips? I think dry, biscuity, sugary stuff has a tendancy to catch on fire in the microwave. I once fused a chocolate biscuit to a plastic container with a microwave (by accident). Not sure how it happens though. I can explain the doughnut burning like so: Not enough liquid in the microwave catching the rays bouncing around meant that the sugar caught fire, and icing sugar in particular is one of the best ingredients easily obtained to make a smoke bomb with (sugar that’s very finely powdered). For Fes, one of the men behind betweenfailures.com, whom I know no other way: Good luck with the days ahead, and remember that killing yourself through neglect is not what any decent brother would want. So make sure to keep up your eating, sleeping and the rest of it while you work through your loss, and remember to keep a watch on the rest of your family and friends affected because death is the ultimate break in habits–it can make us forget what’s important in the here and now and do stupid things like drink and drive because we’re too distracted by grief to be smart. I burned microwave popcorn once when I was twelve by following the instructions on the package. Apparently they hadn’t been updated it since the 70′s and I put the popcorn in to cook for four minutes. My dog saved my life, she started barking when it started smoking and I came in to see what was wrong. Since then the inside of the microwave has an orange brown tint and I have figured out that in my microwave the exact time for good popcorn is 2 minutes and fifteen seconds. I also want to say that I hope things get brighter for Fes. What’s more baffling, is the very idea of him placing a shirt in the microwave. Perhaps, it needed to be warmed. I have so far managed to ignite garlic breadsticks, and penne soaked in olive oil in my microwave, which clearly has an aversion to my consumption of itallian food. To Tchib, I’ve burnt popcorn easily, the microwave bags have a section that will heat up and force the heat at the kernels, they will continue to heat up if they’ve popped, but don’t start going bad right away. To Katiee, any true Italian food lover will never use a microwave. The manicotti comes out limper than a 100-year old without Viagra. You use a toaster oven, keeps it nice and firm. A grape almost split in half under a glass makes for a really good microwave resonant antenna that will erupt into a plasma ball and can destroy the microwave under certain instances. I just did the same thing….I put leftover french fries (in it’s red cardboard holder) for just 20 seconds and I didn’t realize that after it was done, it was already smoking on fire. LESSON: re-heating FRENCH FRIES can be a SERIOUS FIRE HAZARD. How come this never happens when I put a fork in the microwave? Yeah, you can put metal in a microwave as long as it’s not all that’s in there. You know what you can’t? Cheap plastic.